I had never been to Chicago until the day I showed up in a U-Haul with all my stuff. Before then, I was at a one-year theater program in Blue Lake, California, where Billy the Clown, the founder and self-titled Chief Goof-Officer of CircEsteem, a nonprofit youth circus in Chicago, came to audition students for a job. Several classmates and I got the job and formed the first CircEnsemble. Our role was to teach, chaperone, perform, tutor, do administrative stuff—basically, we were jacks-of-all-trades who would help ease the burden on the growing, lightly staffed organization. 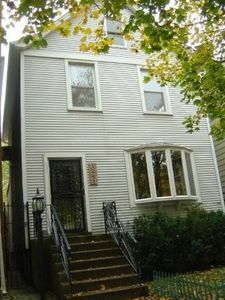 It was the summer of 2007 when I drove the U-Haul to the 4-bedroom house near the corner of Hollywood and Broadway off Lake Shore Drive’s northernmost exit. My two roommates also went to the theater program in California. Wade, a young, bulky guy, attended the program the year before I did and drove a motorcycle. Debbie was a yoga enthusiast with short, curly hair who was also my next-door neighbor in California. I was 23 and exploring a career in theater, though deep down I knew that law school was inevitable. The owners of the house were two Polish brothers, both named Jerry. (They were friends who had hit on a pair of sisters at a bar and later married them.). Wade got the Jerrys to give us a discount because we were “artists.” The price was a steal, especially when split among four people. The fourth bedroom was unoccupied, so we sought another roommate on Craigslist. We didn’t want just anybody, so we made our artistic endeavors and clownish tendencies clear in our post. After numerous bogus responses, we finally heard from a real-sounding, possibly even cool person named Shayna. She had just moved back to Chicago and was living in a cramped studio apartment and looking for a job. We arranged for a visit. Shayna was short, almost dwarf sized, with pale white skin and jet black hair. She was a former Wiccan, she would later tell me, and though she’d given that up, she still wore all black. It was a pleasant visit, and she decided to move in with us after her other option fell through. She soon found a job as an executive assistant. Shayna joined us the beginning of October, and things were great at first. Wade, Debbie, and I all got along with her. She got to meet our other friends in the CircEnsemble, too. She thought one of them, Pete, whose wardrobe consisted mostly of Hot Topic, was hot and told me so with a sheepish grin—she was 26 and he was 19—but it wasn’t reciprocated. So that’s how things were for the rest of October. We all got along, but Shayna never became part of the group. She spent most of her time in her room with the door closed. This is how we paid rent each month: rather than hand the Jerrys four separate checks, we alternated paying the full amount, and the other roommates reimbursed. November was my month. I paid, and my roommates, including Shayna, reimbursed me. A few days later, she told us she was leaving for California to take care of her grandfather because her grandmother had just died. It would be for only a couple weeks. She took her desktop computer and some clothes with her, but left lots of other clothes, boxes of random stuff, and her Xbox and PlayStation 2. We were all, of course, stunned. Pete was the most hurt. When I told him, he looked away, and I could hear his nasal breaths. None of us had any idea that Shayna was at risk for suicide. We took stock of what Shayna had left: clothes, gaming systems, etc. (Pete would later alter one of her sequined black shirts into a vest for himself.) We intended to mail the gaming systems to her mother as requested, but I figured why stop there? It would be awkward—I wouldn’t know what to say—but I felt it was the right thing to do, and even a bit heroic. Calumet City was less than an hour away. I would take all of Shayna’s remaining stuff home. I looked up the address on whitepages.com and found the corresponding phone number. I called. Shayna did her best to avoid me. First she wouldn’t come to the phone because she was lying down. Then after I tried her cell, she texted me to say she was out of minutes. Finally, when I told her to use someone else’s phone, she gave in and called from hers, and I answered. She told me the rest of her story. Allegedly, this is what happened: She went to New York after her grandfather’s death to take care of her grandmother. (Never mind that she had said it was her grandmother’s death in California when she had taken off in early November.). Overwhelmed, she attempted suicide and committed herself to a hospital. After hospital bills, she had only $50 to her name. She went back to Calumet City to visit her parents and make amends—she hadn’t talked to them in two years. 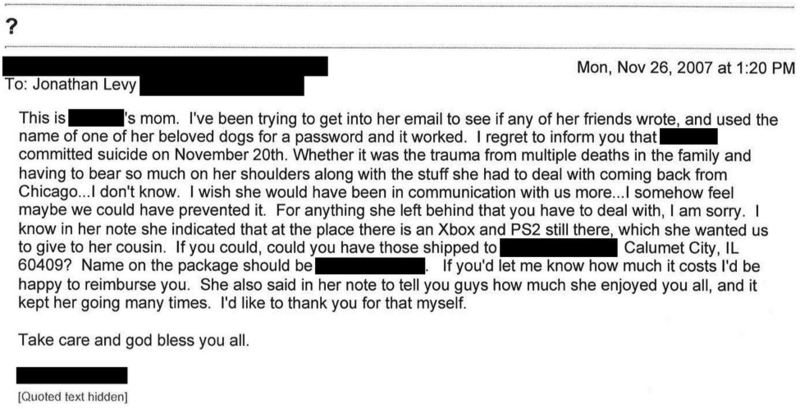 She fabricated the email because she wanted to start all over. Now she was about to take a bus to California to visit her aunt and move there indefinitely. We talked about money. She said of course she would pay, as soon as she got a job in California. We all knew we would never see a dime, and we never did. Shortly after Shayna had left in November, Pete moved into the basement. Then in January, a friend of a friend moved into Shayna’s room, and we were five. I Googled Shayna once about a year ago, and again as I wrote this story. She’s married, lives in Chicago, and works as a freelancer. She cost me about $200 that winter in 2007, but gave me this story to tell forever. I say it was worth it. Jonathan Levy is a law-school graduate living for the time being in Arlington, VA with his wife and two dogs. He joined the writing world late last year, and so far the staff and readers of Boston Literary Magazine and Pure Slush have made him feel so grateful and lucky.